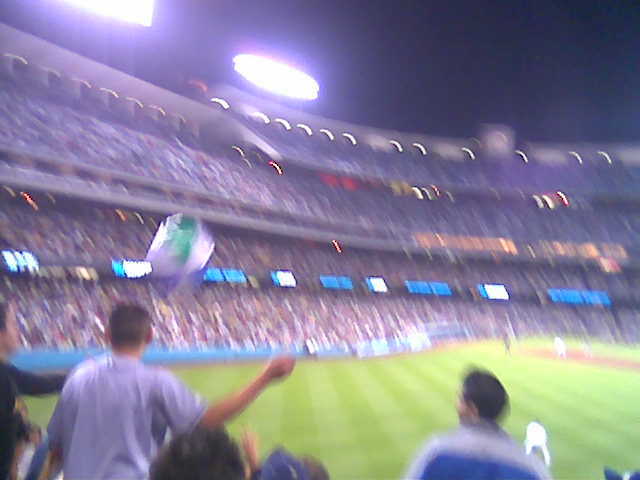 So I went to Saturday's Dodger game and this is all I saw. Just as blurry too. Sat in the bleachers and the crowd was more interested in hitting these 99 cent store beach balls around than the game. Dodgers lost 9-3 but I have no idea how because I didn't see much of it. Grown men running through the bleachers, diving in front of little kids to smash the beach ball back up into the stands. There was a pretty cool little girl though that kept stealing the ball from the ushers and bashing it back into the stands. All in all, pretty fun but guys kept showing up on base and I had no idea how they got there. And yes, the Dodgers are going to the World Series where they will lose to the mighty Tigers.